Consider it; if we’re not alone, that’s a mind-blowing possibility. We’re a very ego-centric species in that, inevitability and really, do to no fault of our own; we view everything through our experiences as a species. The idea that another species of supposedly similar, equal or greater intelligence could share the universe we think of as “ours” is startling on many levels (presuming they would “allow” us to “share” it with them). Yet, on the other hand, consider this; what if in the vast universe, we are alone? The human species is the only light bulb flickering in the darkness of the universe. Such a thought startles me as well. It means that if you value intelligence, technology, or understanding the universe then you realize that we, as humans, are not only the very best that the universe has to offer, but that it’s all on us. If we screw up then the universe will remain a mystery. It makes us the one single light of reason in an incomprehensibly large and dark room. For me the idea that humanity is the only glimmer of intelligence in the universe makes all our petty squabbles and politics more damning. It means that the people in power are risking stakes they cannot comprehend for gains so short term that they’re not even visible on a geological scale, much less a cosmic one. Imagine all that humanity could accomplish, the colonies of life and reason spreading throughout the cosmos, every planet we visit and terraform would bring new and unique life into the universe, imagine the wonders we could create and then realize that we risk it all over things which won’t matter in 40 years or which would be better solved using reason. Add to it the fact that we risk all of that potential not only for ourselves but for the universe at large, and it is an awesome responsibility. I particularly loved the line “And it means that we are alone in facing our problems; alone in experiencing war and hate and all the darkness that comes from intelligence misused.” Most assuredly, we can pinpoint a plethora of examples throughout history and within a modern context that demonstrate “intelligence misused” on grand and small scales. If we’re truly alone, everything we are and will ever be is rotating around on that relatively miniscule blue planet at the moment and we squander it with senseless wars, hatred and violence? We care about nationalities, as if being “American” is so much better than being “Pakistani” instead of just saying, “We’re human beings.” Or we care about religion, as if being “Christian” means so much more than “Muslim” instead of just saying, “I believe in God?” And this can go on and on and obviously it goes both ways, but why? Why do we care so much? 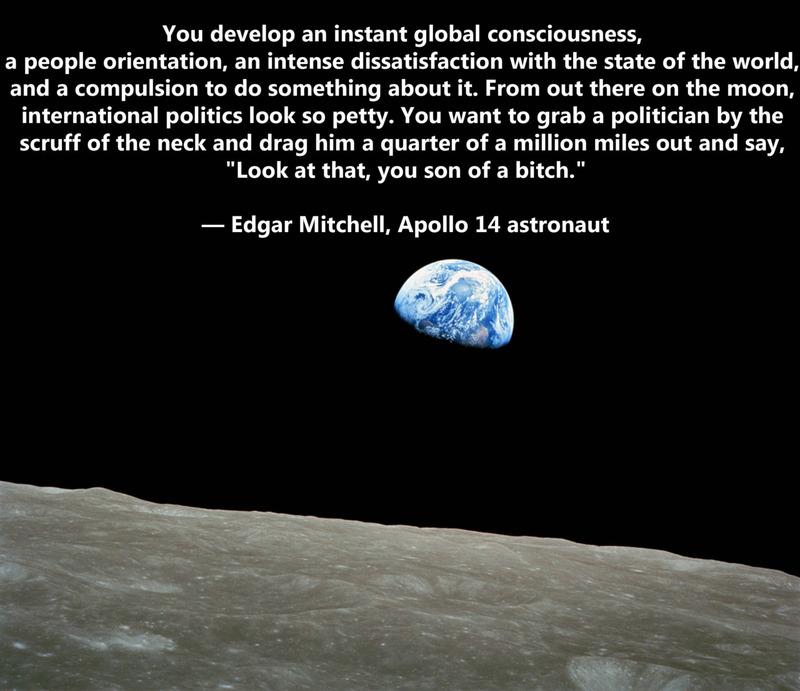 Is it because such a perspective offered by Mitchell is too vast for us to comprehend and appreciate and to enable a change? Of course, with the billions of galaxies in the universe with billions of potential life-supporting intelligent-breeding beings, this could all be moot. Or not because there is no guarantee that we would ever cross paths. I do not intend to make this a cynical, “Why can’t we all get along?” kinda pleading because obviously, there are many, many examples of the greatness, awesomeness, kindness and vast potential of the human species throughout history and in modern examples, but as usual, I feel, we in the “now” seem to think we have it figured out without realizing that we are no further steps away from the caves than our forebears. To grasp the concept of a vast universe one needs not to visualize the extent of it’s entirety. This world was vast once until the invention of the telephone. The conflict within our minds and hearts is the loneliness we feel when there is no one to understand our pain or joy. It is then when we look into space in hopes to find others whether extraterrestrials or God. Death is better than persecution, and our greatest persecutor is loneliness.